Patagonia, for the longest time, isn't exactly the place where one can find a luxury resort. Instead, it's about hiking, camping, wind, and gorgeous views. Thank god that Awasi came along and set up "camp" near Torres del Paine. Otherwise I don't think I would have ever come to this part of the earth. While I never stayed at Explora Patagonia before, but having visited it briefly and seen various pictures online, I feel I had made the right choice for me by staying at Awasi Patagonia. I will go into the difference I see between the two resorts so you can decide better for yourself which is more preferable for you when you come to Patagonia. Location: Awasi Patagonia is located outside of Torres del Paine National Park. In fact, it takes about an hour or so to get to the entrance of the park and another half hour to get to where most hikers take a boat out to start the W-trek. So this is the dilemma for visitors: to stay at Explora Patagonia which is right in the middle of the park or to stay at Awasi and take the daily car ride in and out of the park. It really depends on what you are looking for. For me, Awasi Patagonia is a perfect location as I can look directly onto the famous three towers every morning when I wake up and when I go to bed (sun is up until 10PM at this time of the year). The decision is similar to when one go to Bora Bora in French Polynesia. Do you stay at the foothill of Otemanu or do you stay at islets and look at Mount Otemanu. Most people would argue that when going to Bora Bora, they want the Otemanu view from islets. To me, this is no different. Since I'm not an avid hiker and my purpose to come to Patagonia is so I can get photos for my instagram account (joking), Awasi was a better choice for me. Lodging: Awasi wins hands down. The rooms at Explora Patagonia is small. The largest room is 450 square feet and those get booked up very quickly. Then you are left with a tight 300 square feet rooms. No thanks. I get that coming to Patagonia, you are not going to stay inside all day. It's about experiencing the nature outside. However, when I do decide to stay inside, I want to feel comfortable and not claustrophobic. At Awasi, every independent lodge (read lots of privacy) is 1200 square feet. Not only it's substantially bigger, the furnishing is also much much better. Explora Patagonia looks like a nice dorm room with a bathroom that 1990s are calling and they want it back whereas Awasi Patagonia looks like a proper luxury resort bathroom. With that said, I had issues with my shower temperature during my four night stay going from warm to hot to warm to hot which was annoying but not a deal breaker. Management was never able to fix it during my stay. Talking to other guests, they didn't have the same problem so I guess it was just bad luck for me and hopefully they fixed the lodge I stayed quickly before another guest arrives. Food: The food at Awasi was exceptional for a resort in the middle of nowhere. I was really impressed with the plating and taste of the food. I would say food was around bib gourmand to one Michelin star level (closer to one Michelin star). Chef used lots of local ingredients and service was friendly but not intrusive. In fact, I would say restaurant staff here were some of the very best I've encountered anywhere at a resort setting. They found out your habit and things will magically appear without asking. I like to drink ice tea with my meal and after the first meal, I never had to ask for it again during my stay. That gives you a glimpse of the amount of personal attention one gets when one stays here. Guide: I was very happy with my guide. He drove me everywhere and anywhere I asked. We went to Torres del Paine national park as well as many other places outside of the national park. I like the idea of having my private guide. He caters to my schedule and not the other way around. I know at Explora Patagonia you are put in a group and you are on a schedule. So if you are stuck with people like me who barely hikes, then too bad for you... we are going to hike at a turtle pace. Having a private guide, I can sleep in and start my day at 11AM. I never have to cater to anyone else's whim except my own. This is the way luxury travel should be. 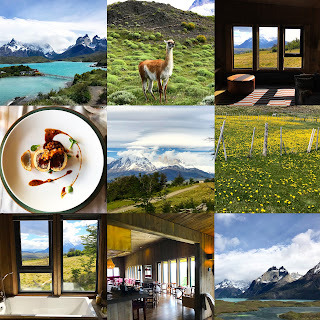 Facility: Awasi Patagonia has one single main building where you can lounge or take in food. Unfortunately there is no spa facility and if you want a massage, a masseuse will come to your lodge. There is a firewood hot tub next to your villa. Yes, you read that right, literally firewood. The idea is great. How often does one actually get to sit inside of a tub of water that's warm by firewood. On the other hand, if you come here during windy seasons (spring, summer, fall), then there is a good chance the wind is too dangerous for them to lit up fire under your wooden tub outside. To me, the idea of firewood tub is cute and romantic, but someone forgot it's really really really windy here in Patagonia ALL THE TIME (except winter as I was told). A jacuzzi tub powered by electric makes much more sense IMO. Activities: I stayed four nights and five days. It was the perfect amount of time for me. The first day was just arrival. Currently LATAM flies to Puerto Natales on Tuesdays and leave on Saturdays which fit into my schedule to a T. If you arrive at Punta Areanas (which LATAM flies to daily from Santiago), then you will have to take a 5 hour car ride after you land whereas Puerto Natales is hour and a half from the resort. Much more doable IMO. The second day I spend the whole day inside the Torres del Paine and saw waterfalls (with crazy strong wind), Lake Pehoe, lots of guanaca, and various mountains . The third day I went to Baguales area which is about an hour and a half away from the resort. Apparently Awasi rents access to this area from various owners and they are the only resort in the area has access to the very end of the road where I saw a profusion of dandelions. It was stunning. Because this area is private, you don't see hoards of tourists like Torres del Paine has. The fourth day, I went to Grey Lake inside the Torres del Paine National Park. Unfortunately the wind was so strong that day they cancelled the boat tour to glacier. I did see some icebergs and you can see the glacier from afar. My first time. The last day was time to pack up and go back to civilization. So five days was perfect. If you only stay three nights, you will have to miss some stuff. If you are very into hiking, then you will need easily eight nights nine days if not longer. For a city slicker like me, four nights and five days was perfect. Overall, I was very happy with my choice of lodging. Honestly, if you are looking for luxury lodging options in Patagonia, this is the only choice. In fact, this place is reminiscent of experiences I have at various Aman resorts. I would not be surprised if the owner of Awasi is an Amanjunkie. If you stayed at Aman resorts before, you know they give you little gifts nightly. At Awasi Patagonia, they do the same. Also everyone here knows who you are just like at Aman resorts. They know your preferences and you never have to repeat yourself over and over again like when one stays at those big anonymous Starwood properties. If you are totally gung ho about hiking inside the national park all day and everyday you are here, then I would probably recommend you to go to Explora Patagonia despite their inferior lodging and food. If you are looking for a true luxury experience with varied destinations beside Torres del Paine national park, then Awasi Patagonia will be better for you.